Last modified on December 4th, 2014 by Joe. In this Android tutorial you will learn about Geocoding and how to find latitude/longitude for a give address location. In a previous tutorial we learnt about reverse geocoding to find address for a latitude/longitude. This tutorial is a reverse of that. Geocoding is converting the physical location address to latitude and longitude. Reverse geocoding is finding the location address based on the latitude and longitude. 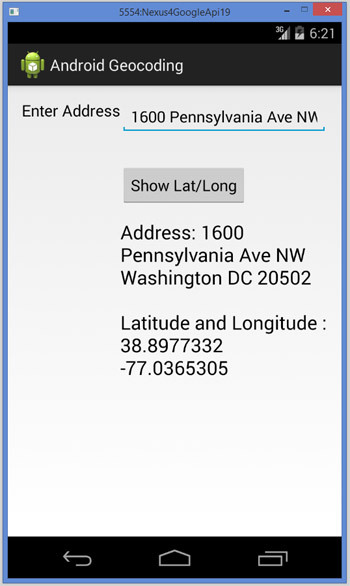 In this Android tutorial, we will be doing Geocoding to find the Latitude and Longitude of a given address location. We need location access permissions. Following lines should be added to the AndroidManifest.xml. We should run the external API access in a separate thread in order not to disturb the UI activity. We should instantiate the Geocoder class and use the method getFromLocationName to get the complete address which includes the latitude and longitude. Comments on "Android Geocoding to Get Latitude Longitude for an Address"
how to show latitude and lang in androi please give your feedback in easy steps . First of all, thanks a lot for time spent in this tuto. I followed it and made some modifications, it perfect to me. I just have a doubt set latitude and longitude in differents fields. In fact, what I am trying to do is modify the following code snippet. to get latitude and longitude and send to 2 different fields. The code crashes and gives an Exception: Unable to connect to Geocoder, for some locations. It times out while trying to connect. Comments are closed for "Android Geocoding to Get Latitude Longitude for an Address".